The moment we've all been waiting for: Estonian Craft Camp. This is the whole reason for our adventures: a five day craft camp learning traditional handicrafts. 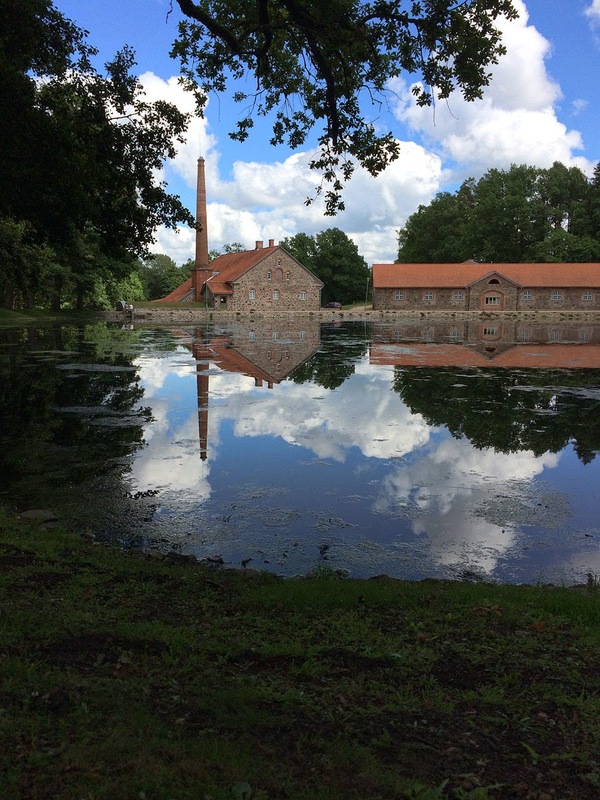 Estonian Craft Camp takes place on the picturesque college campus at Olustvere in the countryside of Estonia. This was the first ever Estonian Craft Camp so we didn't know what to expect, but it went above and beyond any expectations. We were each able to take three classes on various traditional Estonian handicrafts. Amber and I each took different knitting classes and today we are here to report on our adventures in Estonian knitting. 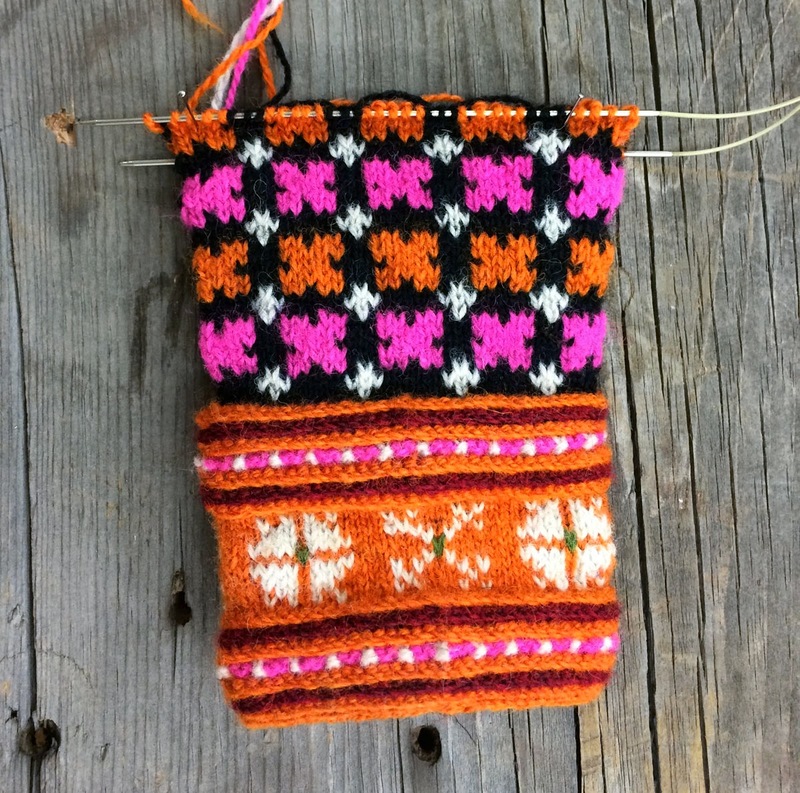 I took a class from Riina Tomberg on traditional Estonian Wrist Warmers inspired by the Kihnu region of Estonia. Each county or region has its own particular styles, colors, and patterns in knitting that can help to differentiate them from one another. 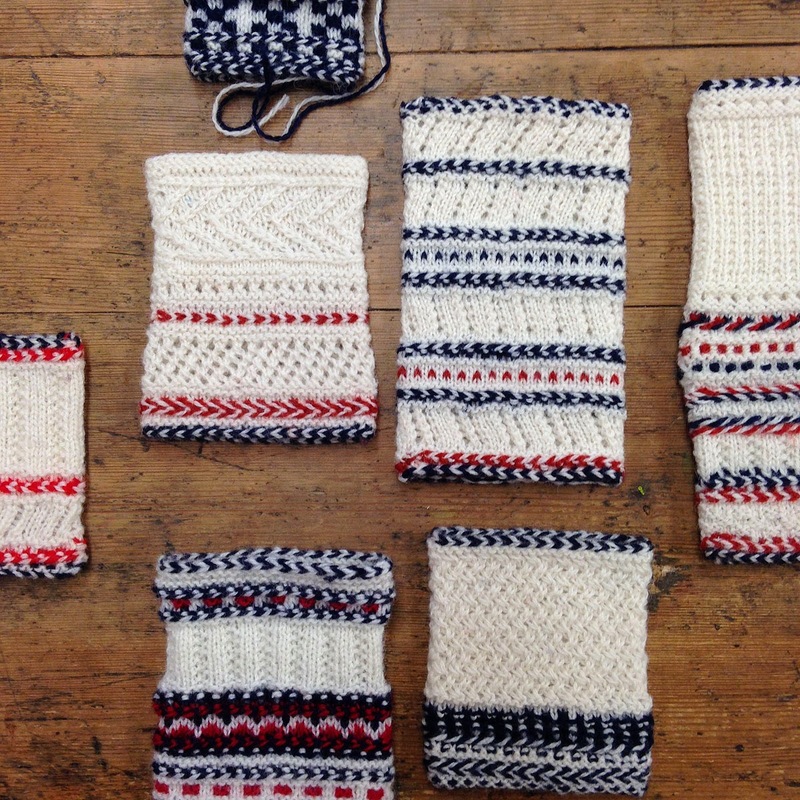 Our project was to make Kihnu-themed wrist warmer cuffs based on traditional cuffs of Estonian mittens. The cuffs often showed a variety of stitches and colors. 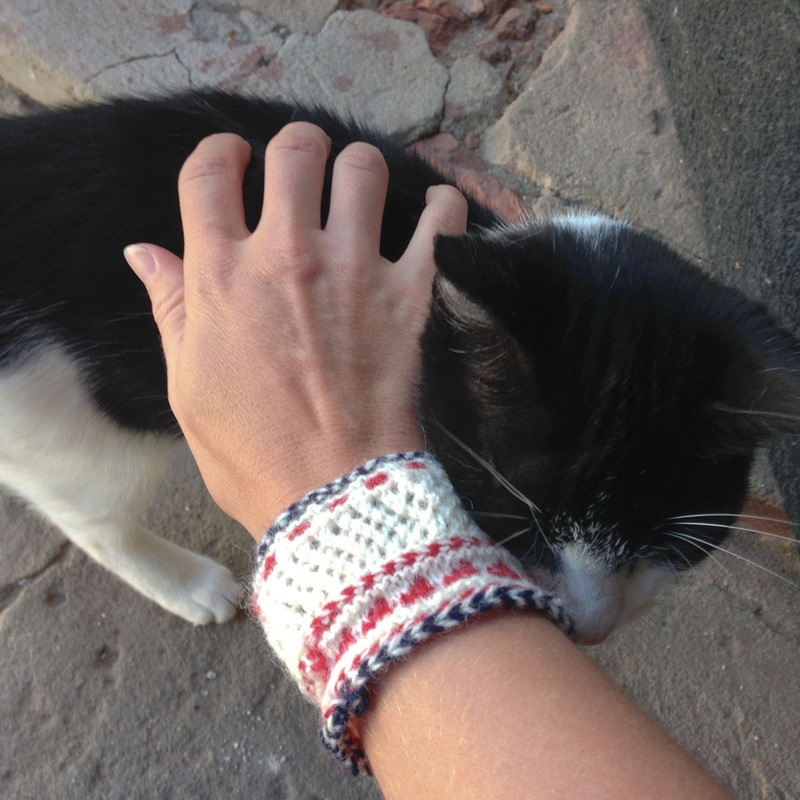 Kihnu wrist-warmers were usually in white with indigo or black contrast and some also had a pop of red. We learned some new knitting techniques including the Estonian two-color braid cast on and cast off as well as how to make "vits" or the 2 color braids that often decorate the cuffs. Riina had many pairs of mittens for us to get inspired by. In earlier times, there wouldn't be knitting patterns, but rather new patterns would be worked when someone saw what a neighbor or visitor had knit (this is another way that patterns would travel from region to region). 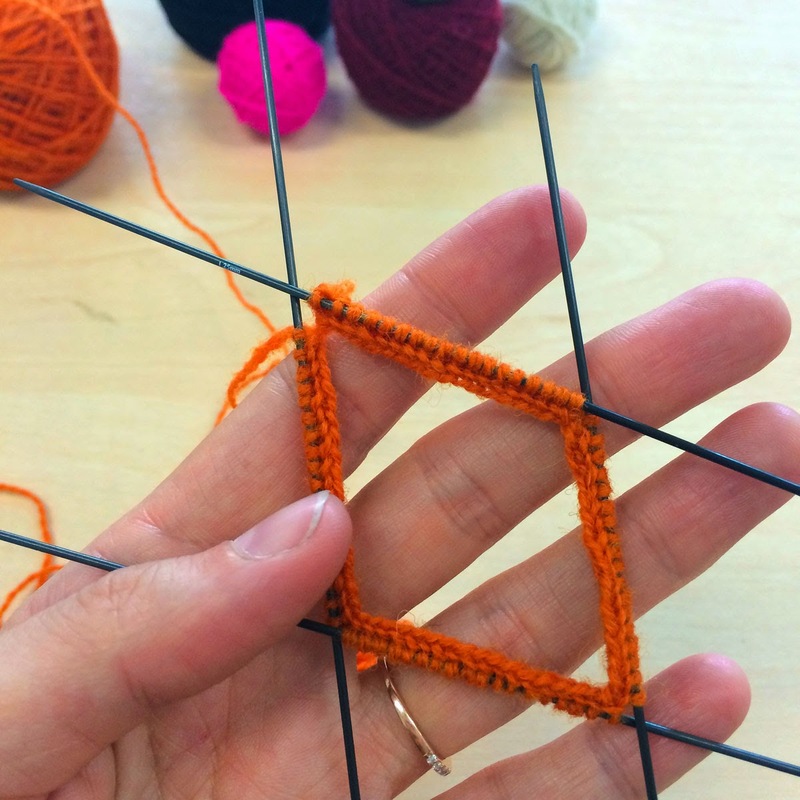 Riina taught us that one had to be able to look at and then knit what they saw rather than always working from a pattern. For that reason, and to make the class more authentic, each student would write their own pattern by looking at various finished knits. I chose to incorporate some of the vits or braids as well as some colorwork and a small amount of lace. I did manage to finish my cuff, which was time-consuming on size 1.5mm dpn (US 000). 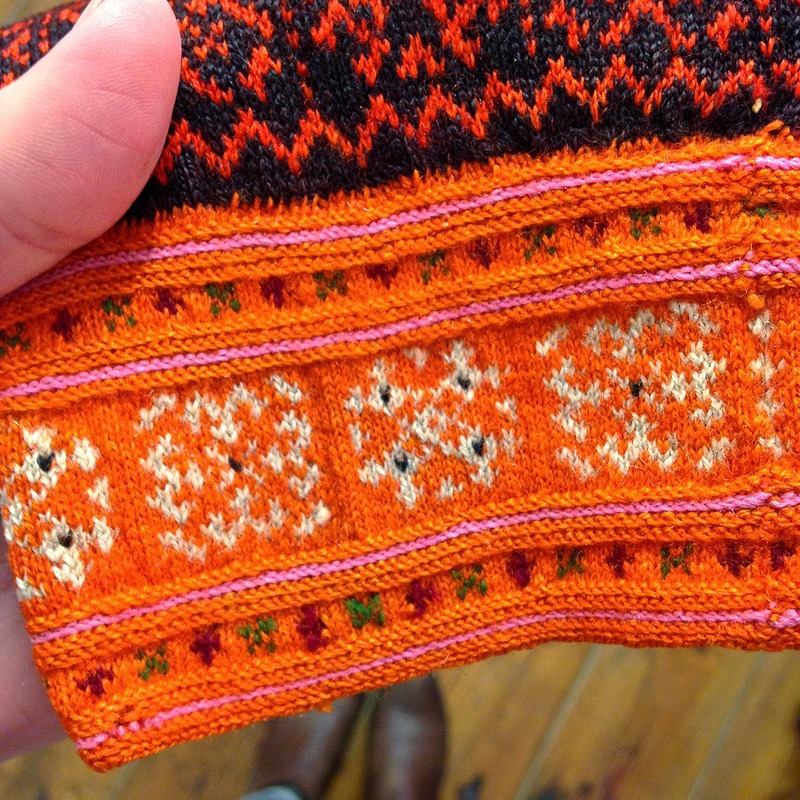 My mind was blown by instructor, Kristi Jõeste's Muhu-style wristwarmer class. Estonian knitting is so intense, but in the best way! Kristi is dedicated to keeping traditional techniques alive. She has researched thousands of mittens and gloves collected and preserved by the Estonian National Museum, and knitted perfect replicas of the most intricate historic pieces. Through this she has become one of Estonia's most well known knitters, and has developed her own modern patterns using traditional techniques and styles of the various regions. 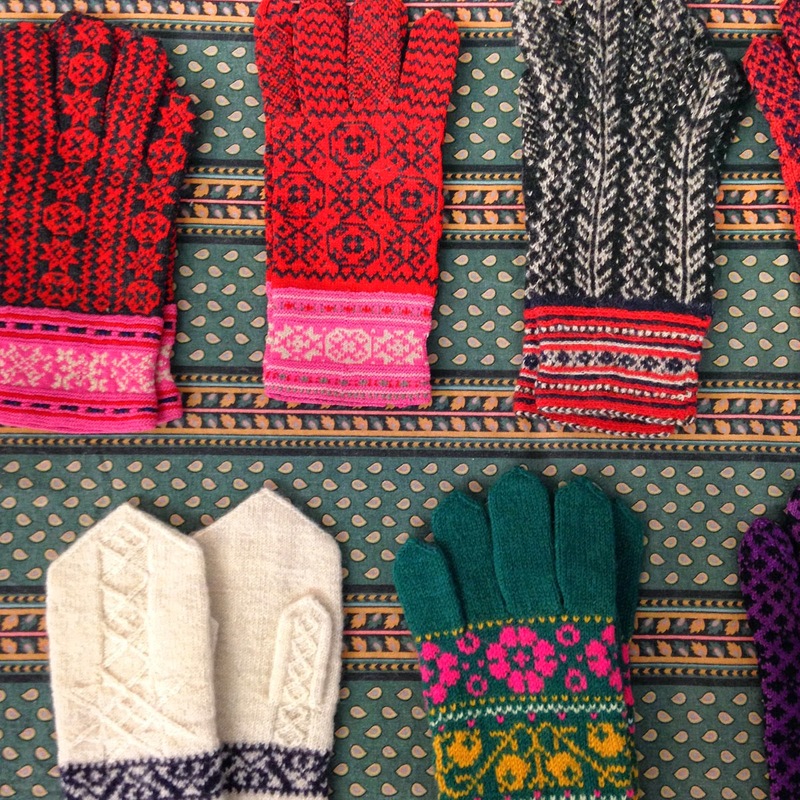 She brought a selection of traditional gloves for us to look at and they were so stunning! In our class we learned to use the traditional techniques osed in these amazing pieces: the Estonian braided cast-on (with both one and two colors), the lateral braid, garter colorwork, and--most intense of all--knitting on tiny 1.25mm needles. That's a size US0000. Ouch. Literally, my arm was sore for the rest of the trip, but I was so addicted to Estonian knitting that I couldn't help but keep knitting. 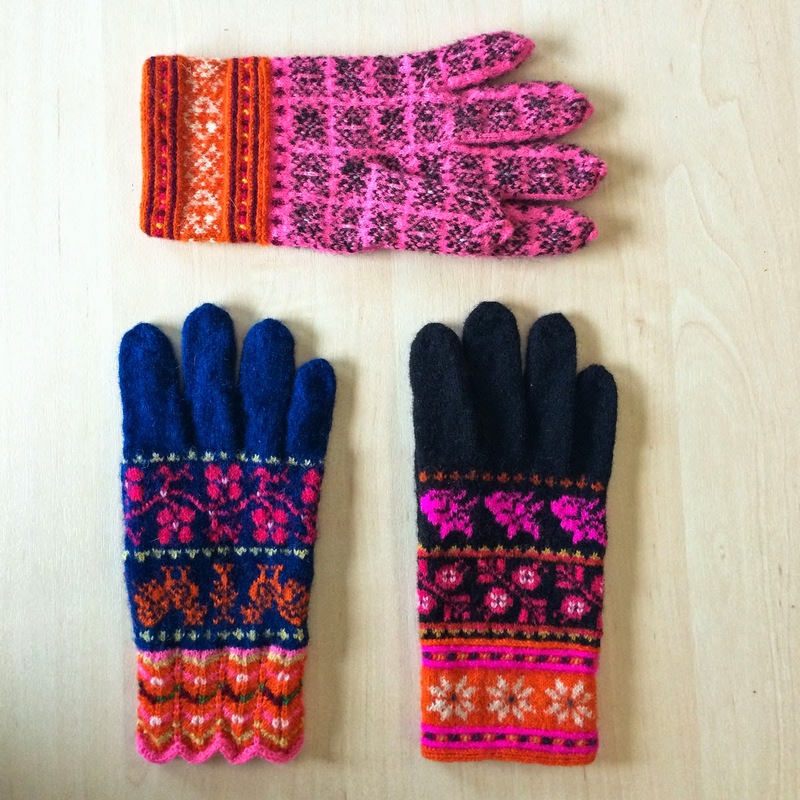 Instead of a wristwarmer, I decided to continue with my knitting and I plan to knit my own Estonian style mittens. 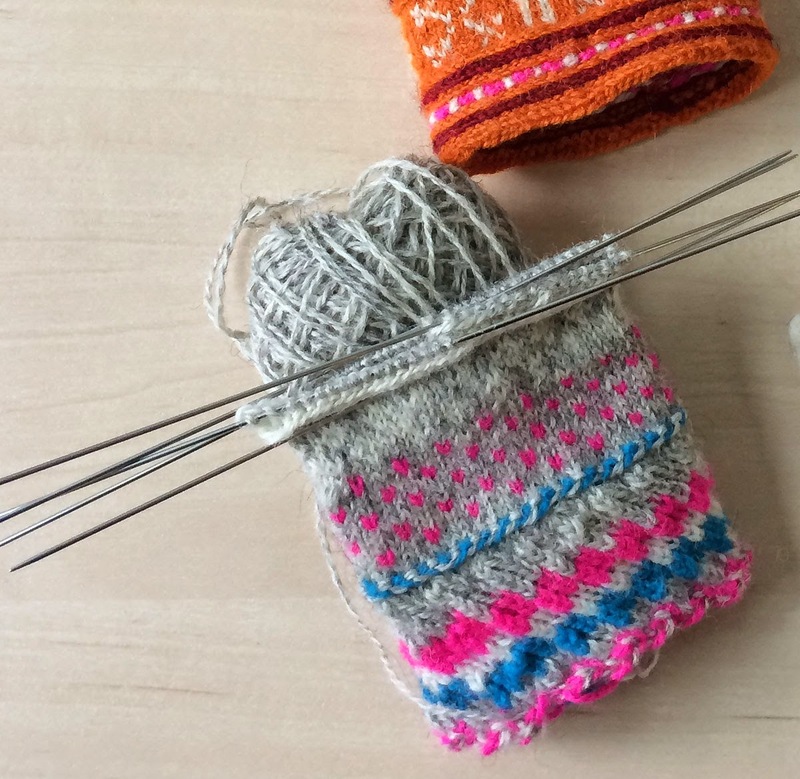 In Kristi's class we also learned to knit the faux-entrelac cuff, which is very prevalent in Estonian mittens. It is surprisingly simple and, by striping your yarn in a special diagonal rib stitch, you end up with a beautiful checkerboard pattern. This pattern is typically used on mittens and gloves, but I imagine it could be a very cool sleeve finish for a sweater! Check in tomorrow for a Craft Camp field trip to visit artist Anu Raud!